Yeah, they live right in the path of hurricane Michael. It had by then been downgraded to just a tropical storm. I guess I can be thankful for that, but Mama bear is irrational. Grandmama bear is worse. And there’s nothing either can do about it except fret and worry and pray. Update: The kiddos are fine, very little property damage, and the cats have stopped screaming. I guess cats feel the pressure drop worse than humans do! BEAUTIFULLY SAID. I AM HAPPY YOUR FAMILY IS SAFE. I LOVE SONG “HEAVEN’S EMBRACE”. THANK YOU FOR SHARING YOUR AWESOME TALENTS. Sally: A very good friend of mine has just been diagnosed with inoperable lung cancer. Due to the situation, he cannot have chemotherapy or radiation. He has been given from 6 months to a year to live. Being a Christian, he is leaning on God for strength, peace and comfort. I gave him a copy of the words to Heaven’s Embrace. I know they will minister to him. My heart has been touched by these words as well and I enjoy the solo rendition on your site. Thank you. Gary, I somehow failed to respond to this message last month when it was posted. It’s hard to know what to say, but I do sincerely hope that song and others like it will give him the comfort he needs. Prayers for your friend! I pray your babies are ok.
Sally, you and your grandbabies are all in my prayers. If it’s OK with you, I’d like to add you all to our chapel prayer list requests. I have 4 grandbabies, the oldest of whom just turned 5 on Oct 6. 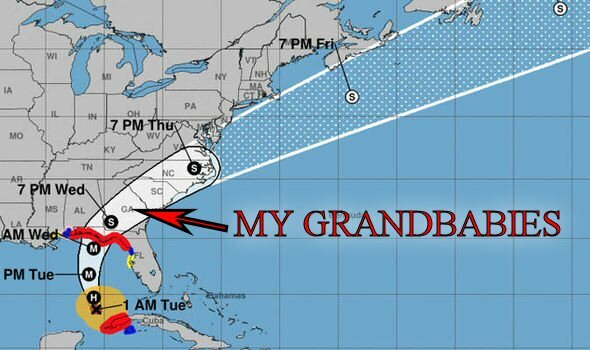 I know that this Grandmama Bear would feel just like you if they were in the path of this hurricane. We all live in Rhode Island, so hurricanes that actually make it this far north are few and far between other than remnants of rain bands. I must also tell you that I have been guest soloing at different churches in CT, MA and RI (as well as almost every weekend at my own chapel as soloist). Parishioners have been so deeply emotionally affected by the songs of yours that I’ve sung – especially “Make Us One” and “He is There”. The organists are now introduced to your amazing music and they have comments like “This is the most beautiful song I have ever ever heard!” (organist from a Baptist church in MA where I sang in Sept) and “What an incredibly beautiful and so powerful piece of music this is!” (organist from a Presbyterian church in Providence, Rhode Island and “This music is emotionally so charged, a delight to play, and need I say more as you heard the applause from the congregation when you finished Make Us One? !” (Congregational church in Connecticut. Done! I know the pastor will pray for those who have been in the path of hurricane Michael. Both he and his associate pastor are always adding earthquake/tsunami/fires/hurricane/tornado victims to the prayer list. So much of it lately. Numerous members of the congregations where I’ve sung “He Is There” have said, “I can’t tell you how much I needed to hear exactly that message today. It’s like it was the work of an angel.” I’ve often thought of you as an angel of God’s messages. Bless you, Sally. “I’ll drop my burden at His feet and bear a song away”..,. It is a truth that grandmothers worry more as they move along in age and through life’s experiences. May things go well for your little ones. Your “Peace, Be Still” composition is tender and comforting. Is it available as sheet music? It touches a chord which is common to all, and would be so pleasing and healing to even just sit and play and sing. Please consider it. Thank you Sally! So glad all is well. Prayers for everyone in the region! Our young adult choir really enjoy your music. Will the sheet music be available soon? 🙂 Which sheet music in particular are you looking for? Ohhhh. I didn’t see it on your website. Am I mistaken or is it not a shared piece? Thanks!! And the lights are on, the trampoline is intact (after spending the night roped to the storage shed), the cats have stopped yowling, and best of all, the kiddies are safe and sound. Hallelujah! years ago a 100 mile an hour wind caused several million dollars damage in our home town of Centerville. What is ironic is my wife is from Orlando. Many years ago, British convert Charles Penrose, living in a cabin in nearby Farmington, wrote a hymn called “Blow Gently, Ye Wild Winds.” On a happier note, early Centerville settler Andrew Dalrymple wrote “O Lord of Hosts,” hymn 178. Peace! What a future blessing our past points of inspiration can be. Grandmama Bear’s concern was well warranted. This is a wonderful testimonial of your faith. You, your daughter, and entire family are in my prayers along with all others in the path of Michael. Thank you. This mama and grandmama bear has her cubs in Georgia also. This is a sweet comforter today. I am listening to this now. Thank you! We are all in turmoil at one time or another and sometimes it seems it’s just one after another after another. Lay it at His feet.